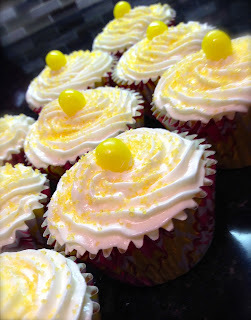 Last week, in honour of my sister's birthday, I decided to bake two of her favourite flavours: red velvet and lemon. I went with red velvet and white chocolate chip cupcakes and lemon explosion cupcakes. Both were a major hit and definitely pleased the birthday girl. The red velvet cupcakes were a delicious blend of chocolate and vanilla, and the white chocolate chips were a sweet surprise. The decadent cream cheese icing was the perfect topper to these velvety smooth treats. 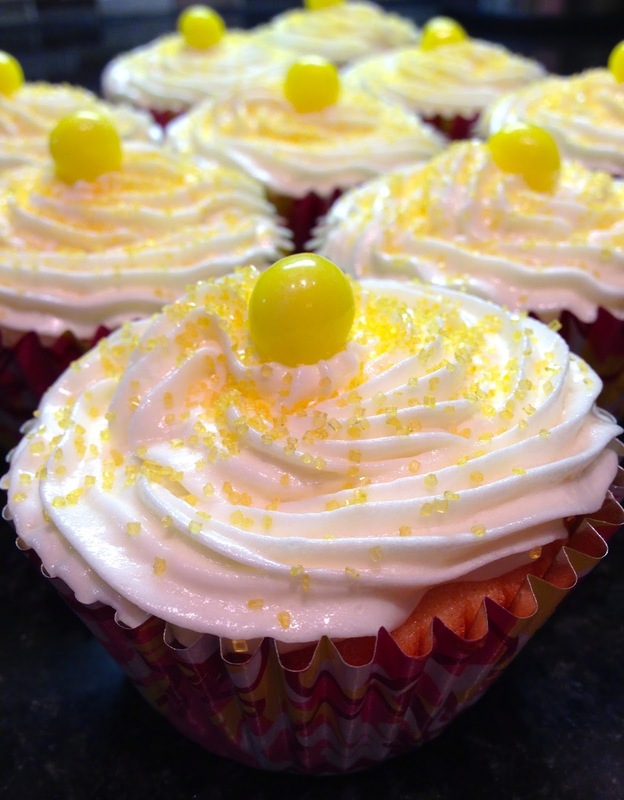 The lemon cupcakes were also a crowd pleaser. They were deliciously light and the whipped lemon cream cheese icing paired beautifully with the lemon vanilla cupcake. You too can recreate these delicious cupcakes by following the below recipes. In a small bowl, sift flour and set aside. In a large bowl, on the medium speed of an electric mixer, cream the butter and sugar together until light and fluffy, about 5 minutes. 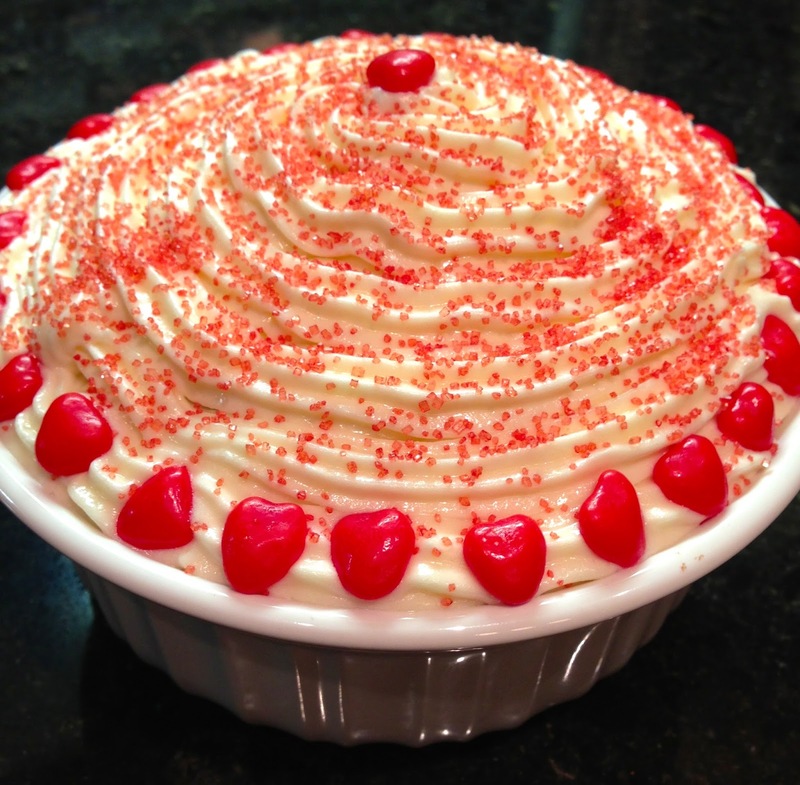 In a small bowl whisk together red food colouring, cocoa powder and vanilla. Add to the batter and beat well. In a measuring cup, stir the salt with the buttermilk. Add to the batter in three parts alternating with the flour. With each addition, beat until the ingredients are incorporated but do not over beat. In a small bowl stir together the cider and baking soda and add to the batter. Stir in the white chocolate chips until well incorporated. Using a rubber spatula scrape down the sides of the bowl, making sure all the ingredients are well blended and the batter is smooth. Divide the batter among the prepared pans. Arrange the oven racks in the upper and lower thirds of the oven and bake the cupcakes, switching positions of the pans halfway through baking, until tester comes out clean, about 20 minutes. *Word of advice: cut all ingredients in half, or else you will end up with a ton of extra icing. 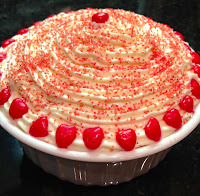 Using an electric mixer, mix the butter and cream cheese until smooth. Add the salt and vanilla and beat until well incorporated. Slowly add the powdered sugar until desired consistency. Position a rack in the middle of the oven. 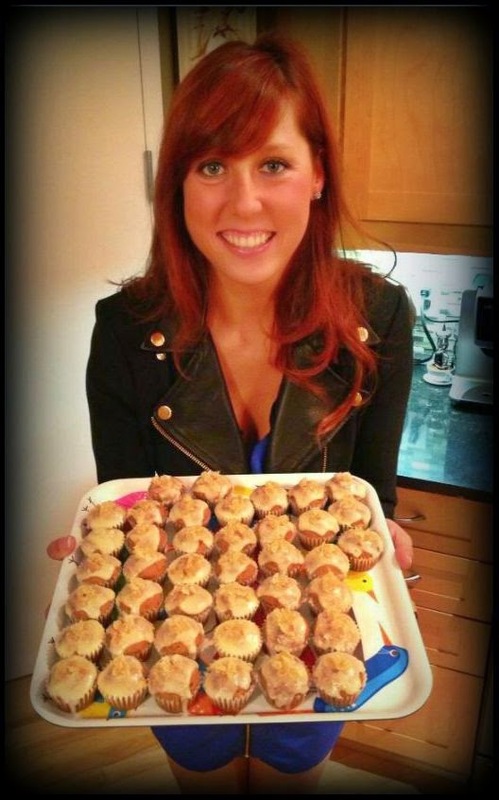 Preheat the oven to 350 F. Line 12 muffin tin cups with paper cupcake liners. Sift the cake flour, baking powder, and salt into a medium bowl and set aside. In a large bowl and using an electric mixer on medium speed, beat the butter and sugar until smoothly blended and lightened in colour, about 2 minutes. Add the lemon juice, lemon zest, and vanilla and beat for 2 minutes. On low speed and in 3 additions (3 flour, 2 milk), add the flour mixture and milk alternately, beginning and ending with the flour mixture. Mix until the flour is incorporated and the batter looks smooth. Fill each paper liner with 1/4 cup of batter (an ice-cream scoop works well), to about 1/2 inch below the top of the liner. Bake just until the tops feel firm and a toothpick inserted in the center comes out clean, about 23 minutes. Cool the cupcakes for 10 minutes in the pan on a wire rack. Remove the cupcakes from the pan onto a wire rack and let cool completely. In a large bowl, using an electric mixer on low speed, beat the butter, cream cheese, grated lemon peel, and vanilla until smooth and thoroughly blended, about 1 minute. Add the powdered sugar, mixing until smooth, about 1 minute, then beat on medium speed for 1 minute to lighten the frosting further. Use a small spatula to spread frosting over the top of each cupcake.